You never realize how quiet your house is with only one child until you have over other families with multiple children. It makes our house seem like a library! So once in a while in the quietness of our home, Mack and I crank up the music and get to dancing! Sometimes that dancing accompanies a great book. I'm thankful to have a child who loves to read like his Mommy, and loves music like his Daddy. A perfect combination! I've noticed that more and more books come with music, and that too is a perfect combination! 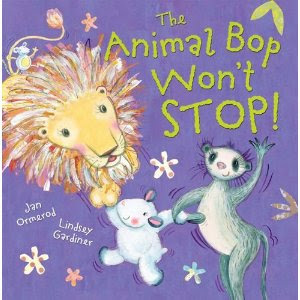 The Animal Bop Won't Stop, a sequel to Doing the Animal Bop, is wonderful story about movement that will have children of all ages shimmying along. The adorable animal illustrations help tell a tale of animals of the ocean, prairies, and jungles moving to the beat. Mack gets super excited to listen to the CD (that comes with the book) and watch my lead as we stretch up to the sky like giraffes, wiggly like jelly fish, and go skippety-hoppity with the lambs. Take some time this week to work on movement and direction with your children. With more and more children relating to kinesthetic learning, this book is an excellent way to introduce the powerful relationship between literature and music. You'll also notice that children's books don't have to come with a music CD to teach about movement and music. Many of Eric Carle and Sandra Boynton books naturally make you want to get up and dance. So prowl like a lion (or a raccoon in search of a sippy cup) and get your hands on The Animal Bop Won't Stop.